Ultimate Direction is not afraid to think outside the box. Borrowing technology from award-winning running vests and fastpacking gear, UD now makes ski packs that let you move fluidly. 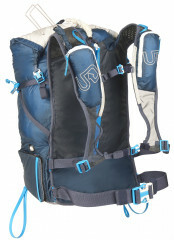 But the Adventure Vest is much more than a big running vest with a ski carry attached to it. Starting from the top, the Adventure Vest features a roll-top closure and nylon-compression straps that zig-zag down the side. This means the 32-liter pack is quiet, secure, and only as big as what you put in it. The main compartment is accessed by way of the roll-top closure. Two huge zippered compartments in the front house food, camera, phone, keys, or strips of bacon. 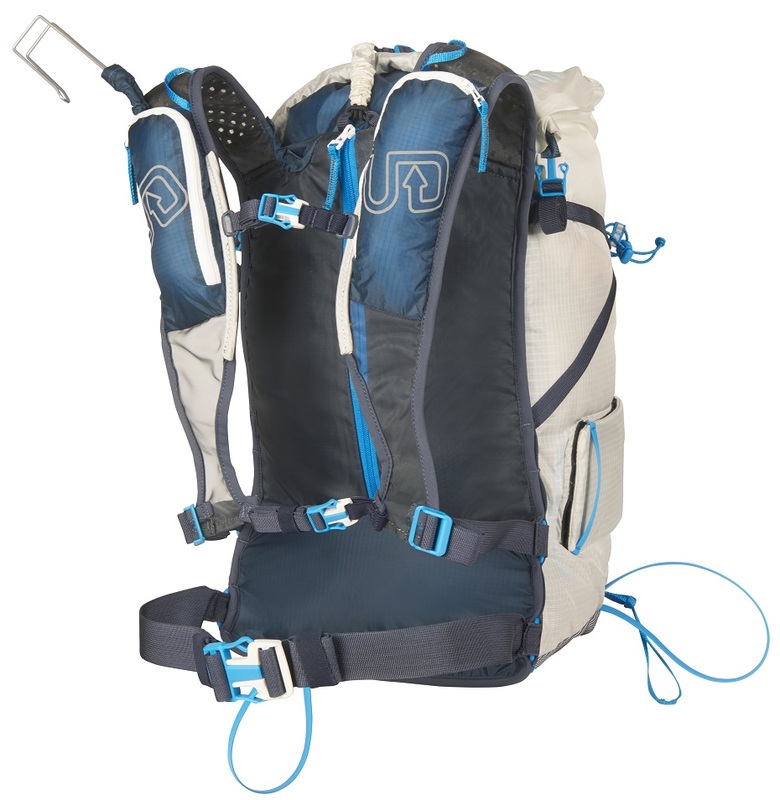 The majority of the pack is made of durable rip-stop nylon that will keep your gear safe and sound. 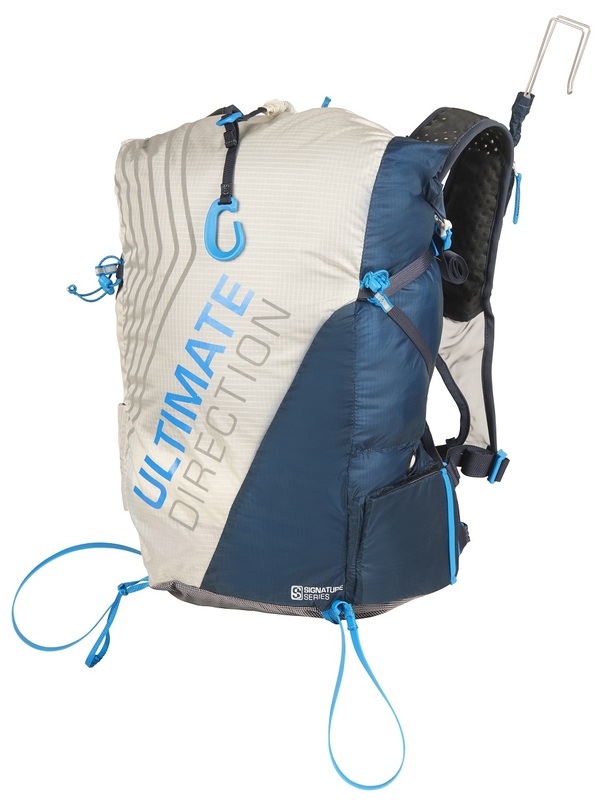 Ultimate Direction’s Adventure Vest is a textbook example of a large volume, highly customizable pack getting the light ‘n fast treatment. Primary ski carry loop is adjustable internally, while the secondary ski carry for partner races is removable. Both ice axe loops are girth hitched, bar-tacked, and removable. Shoulder-straps and sternum-straps feature easy height-adjustment to fine tune the fit. Hip-belt is height adjustable and removable. Zippered crampon pouch features a cut-out to allow for a full-length shovel handle in the main compartment. Dedicated rope pouch is zippered, fits a 30m rope, and has a riveted hole to allow for fast feeding without removing the pack. Breathable shoulder straps are padded and allow for maximum airflow. Zippered back panel quickly accesses the hydration bladder without removing the pack, but can also be used to house a tarp or lightweight bivy sack. Bottom Line Big volume with low bulk. I've been using this pack for about a month and love it. My only problem is the bottle holder. I use a standard cycling bottle and struggle to slide it back into the holder. Any suggestions? Hey Andrew, I can see how that would be a problem. 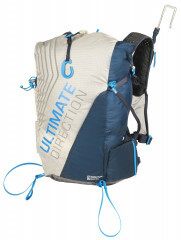 We have Ultimate Direction flasks which are designed to be used by these packs. Hope this helps. 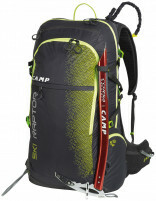 How does the ski carry work with this pack? Can you do an A-frame carry? Hey Aaron! It's designed around having the option to avoid an A-Frame carry thanks to the quick carry options, but an A-Frame carry is an option if you need it. Is this basically the new version of the Skimo 28, or is this an altogether different pack? Hey Mark!! Although similar in volume, it's a drastically different pack. 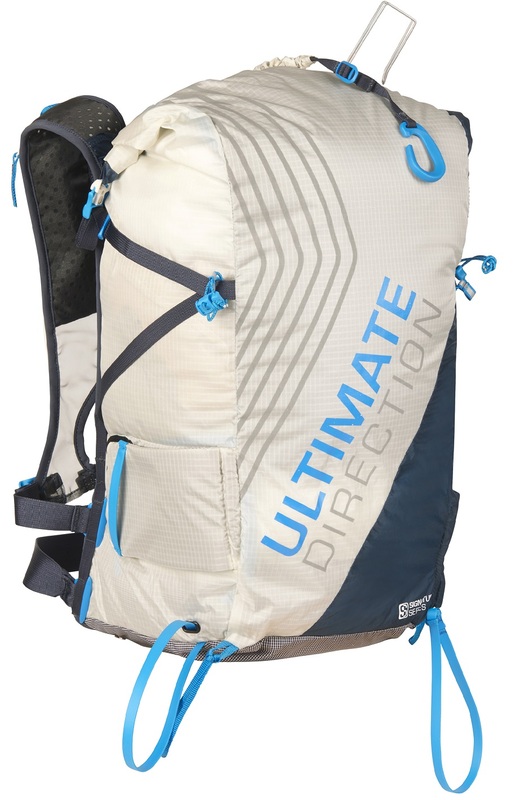 I think they intended it to be a replacement for the Skimo 28 but it really ended up being a pretty different pack altogether and your choice of which pack should be dictated by how you'll be using it (mountaineering, overnights, long races, traverses, carrying camera equipment, etc). 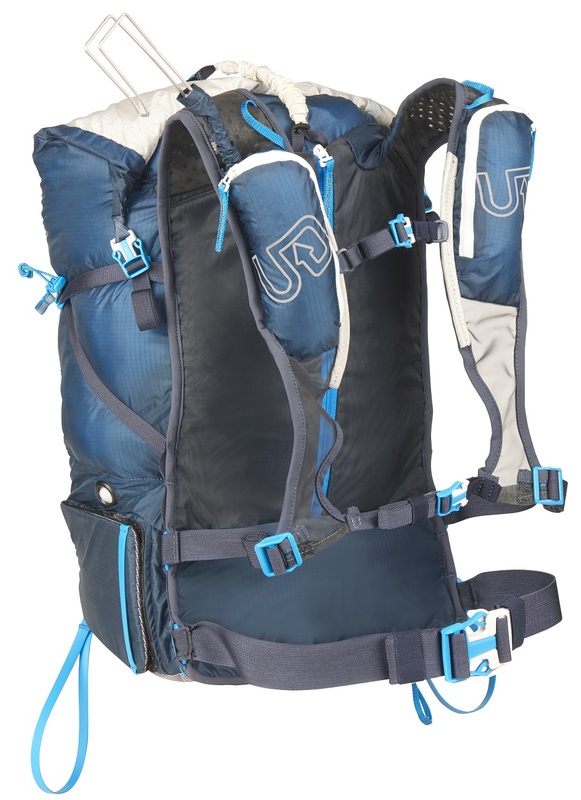 Just because the Adventure Vest exists doesn't necessarily mean the Skimo 28 is outdated, just kind of a different approach to a 30ish liter pack from UD. Is there two different versions of this pack available since there seems to be velcro pockets for the crampons and rope pocket in these photos and zippered pockets in UD website? Is the race hook detachable? Hi Joel, good catch! The production packs definitely have zippers on both compartments. This imagery must have been shot with a pre-production prototype. We will be updating the imagery to show the zippers asap!